Courageous Cultured Pearls are formed as a consequence of a wounded mother-of-pearl oyster. Ouch !!! The nucleolus of this variety of pearl is a foreign enlistment in the form of a bead tissue implant into the soft tissue of a mother-of-pearl. Unable to resist, the pearl converts the pain into a round cultured pearl. Both Cultured and South Sea pearls are the results of the Mother-of-Pearl oyster secreting a healing mantle over the wound. The injury, due to human interference results either in the death of the Mother-of-Pearl oyster or one lucky, plucky Pearl. Natural Pearls which me, my myself and I have termed - 'Pearl of Pearls' (please don't plagiarize me on this one - try referencing back to this site instead :-) are from Alpha to Omega, Natural Nacre -no artificial nucleus to be found here. An American skyscraper once exchanged hands for the price of a pearl necklace! True story. And to add insult to injury, most of these pearls have been modified. A modified pearl is a pearl that has undergone any type of modification or treatment. This information should be disclosed at the point of sale, but most often treatments are not. Bleaching, Coating, Cutting, Dyeing including Tinting, Filling, Heating, Irradiation, Oiling and Waxing. Bead nucleated pearls are more affordable than Rare Natural Pearls but don't be fooled into thinking these Pearls are your cheap types of pearls. One look at the price tag of the Mikimoto Pearl necklace (see image further down the page) will dispel all such thoughts. Wear your moonlight orbs with responsible excess, with jeans and a T-shirt or lightly caressing the shoulder of that little black dress. Whether your pearls might appear in the form of an antique engagement ring or three strands of ovoid-shaped, varicolored gems will forever be, moonlight rays of light to highlight a woman's natural beauty. Knavery & cunning run rife in this area and the jewelry marketplace is full of Pearl imitations. Purchase pearls from a trusted source. Be really careful when buying over the internet as you can't handle the pearls and never accept at face-value what a salesperson tells you. It pays to read up on the subject. A list of favorite books about pearls can be found here.. The Pearl Grading System will bring you up to speed and have you grading pearls like the experts. Don't be put-off by Faux pearls or imitations, if declared, they were the preference of French designers in the 1920s. Coco Chanel always wore a pearl necklace and often incorporated imitation pearls or faux pearls into her own costume jewelry designs - Chanel costume jewelry. Pearls were also a perfect gem for inclusion into the naturalistic style of the earlier Art Nouveau Jewelry design. The origins of both Natural Pearls and cultured gems are from the sea and only one little pearl is ever produced by an oyster in its lifetime. It's a lot of hard work for an oyster to produce a pearl. The traditional round pearls are usually cultured from saltwater pearl oysters, different from edible oysters, which do not produce the same pearly nacre. Artisans who create handmade wedding jewelry often choose pearls to add elegance and classicism to a piece of handmade silver jewelry. Using a pearl cultivating technique first discovered by an English ex-patriate, William Saville-Kent on Thursday Island in Australia, the Mikimoto pearl company copied, yep, the technique and was the first to consistently grow round pearls in the Akoya pearl oyster and market them worldwide. When grading cultured pearls, in terms of fine quality, MIKIMOTO Pearls are the industry benchmark. Some pearl companies have conveniently devised their own pearl grading system. Tread with caution, especially when buying new pearl jewelry and if the price "seems to good to be true" it probably is. To induce the oyster to make a pearl on command, a skilled technician inserts a tiny round bead. typically made of shell taken from an American freshwater mussel and a piece of mantle tissue from another oyster inside the host oyster's gonad. This causes a pearl sack to form around the irritant bead. The sack begins to secrete nacre, coating the bead. After a period of time, a pearl is ready to be harvested. Pearl Connoisseurs say the queen of made-made nucleated pearls are the South Sea Pearls. Saltwater Akoya Pearls are the classic round cultured pearl; the specialty of Japanese pearl farms. The highest quality Akoya Pearls are gleaming and lustrous. It took Mikimoto 10 years to find just the right Mikimoto pearls for this $1,000,000 Mikimoto Pearl Necklace that you see here. 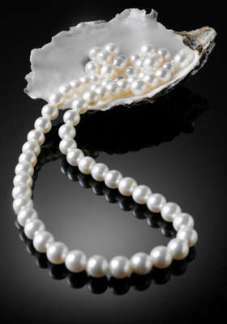 It set the record for the highest price ever paid for a cultured pearl necklace strand at $2.3 million, auctioned by Sotheby’s in 1992. The 17-inch strand had 23 pearls with diameters ranging from 16 to 20mm and a bead-shaped platinum clasp of 60 round diamonds. To give you a comparison, a 16-inch strand of white South Sea cultured pearls can retail for $40,000 to $50,000. Click Here For Further Info About Grading Pearls. The size of the pearl has to do with the age and the type of the oyster that created the pearl (the most mature oysters produce larger pearls) and the location in which the pearl was cultured. The best pearls are those that come from an oyster that dies after the pearl is removed. Oysters that do not die after the pearl has been extracted produce what are referred to as "Biwa" pearls. Generally Biwa pearls fetch lower prices. How much does your bucket of pearls weigh? The measurement, for weighing cultured pearls, is the CARAT and the GRAIN and the MOMME. And in India Jewelry pearls may be weighed in CHAV; an India term for weighing pearls, we discovered from one of our visitors from India. The momme is an old Japanese measure of weight still used for all pearls. One momme is equal to 3.75 grams or 18.75cts. The exception is the baroque pearls which are usually impossible to measure because of their irregularity. Consequently, baroque pearls are measured by sieve. A rare type of pearl is produced by the abalone and are called Abalone Pearls. These pearls are not cultured though, but are natural pearls and are highly collectible because they are natural and often come in unusual shapes and have unique tints. Click Here to Find Out How To Care For Pearls. Bead nucleated Pearls can be divided into Saltwater Pearls and Freshwater Pearls; Cultured Freshwater Pearls (CFWP) are causing a lot of excitement in the pearling industry at present. Of all the Natural saltwater pearls, Natural South Sea pearls are the rarest. Born when a foreign particle makes its way into a host oyster, in the pristine salt waters where the temperature is gentle and the atmosphere nurturing, this type of pearl with a strange perfection bears the fingerprints of forever.